The 2008 Farm Bill is officially known as Public Law 110-246, The Food, Conservation and Energy Act of 2008. The farm bill, renewed about every five years, governs federal farm and food policies. Federal farm support, food assistance, agricultural trade, marketing and rural development policies are all governed by a variety of separate laws incorporated into one farm bill. In addition to all the topics covered in the previous farm bill, the new law also covers horticulture and organic agriculture, livestock, crop insurance and disaster assistance, commodity futures and trade and tax laws. Bonnie Burr, State Director for the USDA Farm Service Agency, presented an overview of the 2008 Farm Bill at the Legislative Workshop during the recent National Grange convention in Cromwell. It is important to note that the first word in the new law’s title is “food.” The underlying purpose of the entire act is to help provide enough food to feed our growing population. More than two-thirds of the act’s funds go to nutrition programs, with more funding for food stamps, food banks, locally produced food and programs to provide food for schools and senior citizens. Many people do not realize that the food stamp program is a provision of the farm bill and is a program of the Department of Agriculture. It is the largest component of the farm bill budget. The new act provides a new name for the food stamp program. Effective October 1, 2008 the food stamp program was officially renamed the Supplemental Nutrition Assistance Program, or SNAP. More and more people want to know where their food is coming from and prefer locally produced products rather than food that has traveled an average of 1500 miles to reach our northeastern consumers. The new farm bill authorizes approximately one billion dollars to support the horticulture and organic agriculture industry. Funding is authorized to support farmers markets, agri-tourism and other enterprises that result in direct producer to consumer sales. The 2008 Farm Bill recognizes the livestock producers contribution to our food supply. The new law provides basic protection for farmers producing livestock and poultry by increasing the oversight of the stockyards and meat packing plants. The previous law, known as the 2002 Farm Bill, required country of origin labeling at the retail stores for beef, lamb, pork, fish, peanuts, fruits and vegetables. The 2008 Farm Bill adds goat meat, chicken, pecans, macadamia nuts and ginseng to the products that must be labeled. Funding for agricultural research and extension activities are made more competitive in the new law. Applicants, including state governments, will have to show that their proposed projects are worthy of being funded. The Cooperative State Research, Education and Extension Service (CSREES) will be reorganized into a new National Institute of Food and Agriculture, or “NIFA”’ Again, note that “Food” comes before “Agriculture” in the title. The new law includes $200 million for the Environmental Quality Incentives Program (EQIP) in 2008 to help farmers and ranchers solve natural resource problems on their farms and ranches, $150 million for the wetlands reserve program and $7.5 million for Agricultural Management Assistance. In fiscal year 2009, which began October 1, 2008, the Farm Service Agency will distribute $1.8 billion in Conservation Reserve Program rental payments to participants across the country. In many of these programs, the funds are divided among the states according to various formulas. However, if a USDA state office does not use all of their allotment in any program, those funds may be reallocated to other state offices having a greater need. 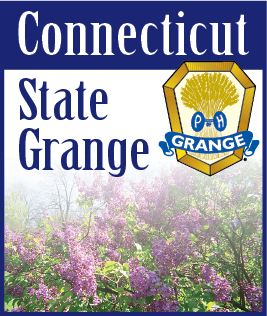 We have two new members on our Connecticut State Grange Legislative Committee, Brother Bob Charbonneau and Sister Alma Graham. Both have been active in legislative affairs for many years and we welcome them as important members of our committee. Remaining on the committee are George Ward, Charles Dimmick and yours truly. The State Grange By-Laws provide that the members of the State Grange Executive Committee are also members of the Legislative Committee. I would be remiss if I did not include Brother Ruel Miller who has also been an active member of our committee. We are all available to assist you in your local or regional legislative efforts. Thanks to Bonnie Burr, State Director for the USDA Farm Service Agency, for most of the material in this article.